Pictures of some exceptionally remarkable bin. Bin, 19th century, formerly a possession of Musharaf Khan. The entire instrument is gilded with gold leaves. The resonator on the left was restored and a cuprous effect appeared later, thus bringing on this greenish hue. Apparently belonged to the legendary Bande Ali Khan. Musée de la musique, Paris. Indian Museum, Kolkata, West Bengal. This instrument, which had a short existence, was designed by the musicologist Raja Saurindro Mohum Tagore. 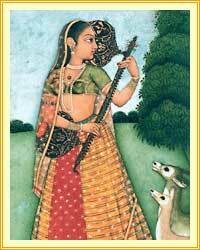 It bears a certain resemblance to the sitar as far as the neck, the frets and the bridge are concerned. Bin, 18th century, Bundi ?, Rajasthan. The resonator on the left here is made of papier-mâché. This bin belonged to Dabir Khan. Bin, 17th century ?, Bikaner ?, Rajasthan. This exceptional instrument has only three peg holes. This feature, as well as the high wooden frets, is mentioned by Abul Fazl in his memoirs of the Emperor Akbar (1593). Unfortunately, the tailpiece sculpted in the shape of a bird and the pegs are missing. Click on each picture to see the photo in a large format.